I get emails often from readers who have tried this recipe or that, or many of them and have had fantastic results and they just want to tell me about it. And I love hearing from my readers, especially when they are happy with the recipes they have tried, but you know, I am just as happy to hear from folks who have questions, or who don’t understand something about a technique, or, heaven forbid, one of my recipes goes seriously awry. I haven’t often gotten any of the last emails, but I did get one a day or so ago, and I wanted to share what I said to the reader, because I think that while I have addressed this issue in the past, it was in the middle of a post, and there was no way for anyone to find it after this. The issue is the use of yogurt in Indian cookery, and why I almost always specify full fat or two percent yogurt rather than lower-fat or non-fat yogurt in my recipes. The thing about yogurt is this–if you use full-fat or two-percent yogurt, it is less likely to separate and curdle when you use it in cooking Indian curries. In fact, when I have used whole milk Greek yogurt (the brand I can get consistently here in Athens is Fage), in curries where the yogurt is part of a marinade that is then cooked for the full time on the stove at a simmer or boil, or where the yogurt is added halfway through cooking in order to cook into the sauce, I have never, ever had it curdle and turn a silky sauce into a glumpy mess. Never.Even when I have cooked it in a pressure cooker, which means it is hotter than boiling. Whole milk regular yogurt, which is not strained generally does not cause any problems. The regular whole milk yogurt brands I like, in order of preference are Brown Cow, Seven Stars and Stonyfield Farm and they all work admirably in curries, though I have found that because they have the thin liquid–the whey–which is mostly water–still intact, they take longer to reduce into a good, thick, clingy sauce. That is why I have switched to using Greek style, strained yogurt exclusively in my Indian cookery. Why do lower-fat yogurts curdle or separate when they are simmered or boiled? But here then is the problem–what if all you have in your fridge is low-fat yogurt and low fat milk, as happened with the reader who wrote to me about her bad experience in making Safaid Keema Mattar? Are you doomed to have a beautiful dish with a creamy sauce one second, only to turn your back to get a couple of plates then see a curdled mess where your delicious curry had been only a few seconds before? No. There are ways around it. One thing you can do, if you only have low fat or fat free yogurt in your fridge, but you want to make one of my recipes, is check and see if you have any cream in your fridge, too. 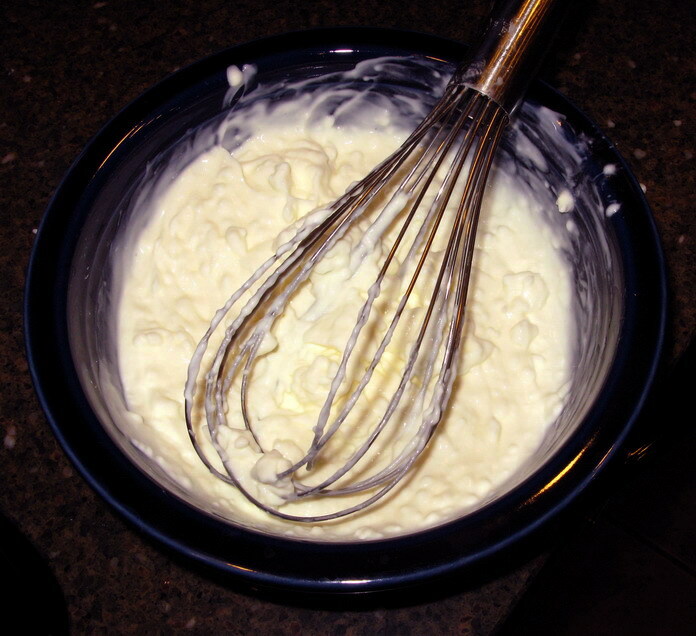 If you do, you can whisk a few tablespoons of cream into your yogurt before using it, and then cooking it gently on lower heat than I specified in my recipe, for a slightly shorter amount of time–and you should end up with a delicious, smooth creamy sauce. What if you don’t want to use high fat dairy items like cream or whole milk or whole milk yogurt in the first place? Are you still screwed? Here’s what you do–you still use your lower-fat dairy products, but you modify the way in which I specify the dairy products to be used in the recipe. If you use only low-fat or fat free yogurt in a cooked curry, add the yogurt, preferably Greek, or if you use regular yogurt, strain it before you use it–at the very end of cooking. And when you add it, only use 3/4 of the amount listed directly in the sauce. Set aside the remaining 1/4 of the yogurt to be added later. So here are the steps you need to take to successfully use lower fat yogurt in your curries–whisk your Greek or regular strained yogurt thoroughly before mixing it into the curry. Measure out 3/4 of the amount specified, and when the rest of the curry is cooked, turn off the heat and stir this amount of whisked yogurt into the curry. As soon as it is incorporated and the sauce has warmed itself through residual heat, whisk in the remaining amount to cool the curry further and remove the pan from the stove and serve the curry immediately. You see, you are not cooking the low-fat or non-fat yogurt at all, which is why I specify that you use Greek or strained regular yogurt for this method. Since you cannot simmer or boil this sauce to reduce the whey and water in it in order to thicken it and concentrate the flavors, you must remove the whey in some other method, and that method is straining it! The Greek yogurt is already strained, which saves you the trouble of doing it, but you can strain your regular yogurt the night before by lining a sieve with cheesecloth and dumping the yogurt into it, then twisting the cheesecloth around it tightly and setting the sieve over a container to catch the whey. If you do this, don’t throw the whey out–you can use it in cooking–you can use it as the liquid in breads, you can use it cooking vegetables and grains, and you can add it to soups or vegetable broths–so long as you are not cooking vegan vegetable broth, of course! If you must cook the yogurt somewhat and you are not using whole milk yogurt, proceed cautiously and only cook 3/4 of it in the sauce, on a very low simmer, stirring the entire time. If it starts to look suspiciously like it is going to curdle, turn off the heat, move the pan away from the hot burner and stir in the reserved amount of yogurt to cool the curry in order to prevent the incipient curdling action. If you are using yogurt in an uncooked Indian preparation, such as raita, it doesn’t matter if it is fat free or whole milk–it will not change the texture unduly to use the fat free or low fat product at all. I hope that this post clears up some of the issues surrounding the use of yogurt in Indian curries and why I often specify whole milk yogurt rather than non-fat or low fat. Once again–you -can- use lower fat dairy products in Indian cookery and often that is desirable, but you must treat them carefully and heat them slowly, and gently, because they are just not as stable as the full-fat versions. I also use only full fat yogurt. I figure I don’t eat a lot of fatty stuff anyhow, and so it’s not that big of a splurge. I won’t eat or cook with non-fat yogurt. Period. Oh, thank you so much for these explanations! I try to stick to using fat-free dairy in cooking as a lot of people in my family have cholesterol problems, and I’ve always had to skip recipes that call for whole milk yoghurts in curries because of this. But now I know that I can use fat-free! This was cool, thanks. I’ve only ever used whole fat regular yogurt in my rogan josh, but the recipe also calls to stabilize it, which I don’t remember exactly but I think involves eggs and cooking it ahead of time. Love the tip about the greek yogurt . . . will definitely try it. I only use whole milk yogurt for cooking/eating too. It has a much better mouth feel than low/non-fat stuff AND no curdling. I’ve never had that issue myself–I like to use Mountain High or Brown Cow plain whole milk yogurt, the former being the thicker of the two. It might be what Diane is referring to… it is not quite as thick as Greek/Fage yogurt but still really great. I eat whole milk yogurt with maple syrup and fruit (mmmm! or have you ever blended honey with yogurt and avocado? heaven!) plus I love it in soups and curries and I regularly use it in my tuna salad with a bit of mayo–it may be whole milk but it’s still MUCH less fat than mayo. Yes – Mountain High – that’s it! Sorry for the goof on the name. It’s really really good. Great post, very informative thanks! Mountain High is my favorite yoghurt. It also helps that it’s made in Denver, where I live :). It is thicker than most yoghurts, but for longer cooking curries, I will strain it in cheese cloth for a couple of hours before using it. The greek yoghurts in the markets here are expensive, so I just strain the mountain high and it works beautifully. I am very glad you posted this Barbara. You just saved me from a disaster with my first attempt to make Safaid Keema Mattar and curries with yoghurt in general. I wouldn’t have understood why it went so wrong and might well not have tried it again. I belong to a region in India where yogurt based curries are the norm rather than the exception. And so there another trick to prevent curdling that I would like to tell you. This will be useful for when you already have everything in the pot, you are stirring (at low heat) like you are supposed to until the liquid hits a boil……..and yet you begin to see signs of separation! Well, I always keep chickpea flour on next to the stove while cooking yogurt gravies since stirring in 1 teaspoon at that crucial time can save the whole pot from going waste! Thats all it takes – 1 teaspoon of chickpea flour. In white gravies where one doesnt want a yellow color, normal white flour will work to bind everything together as well. This trick has been a life-saver more times than I can count. I am very thankful for your blog….quick question: how does one strain yogurt? is it about separating it so it’s not one solid (so to speak) mass? Thank you!